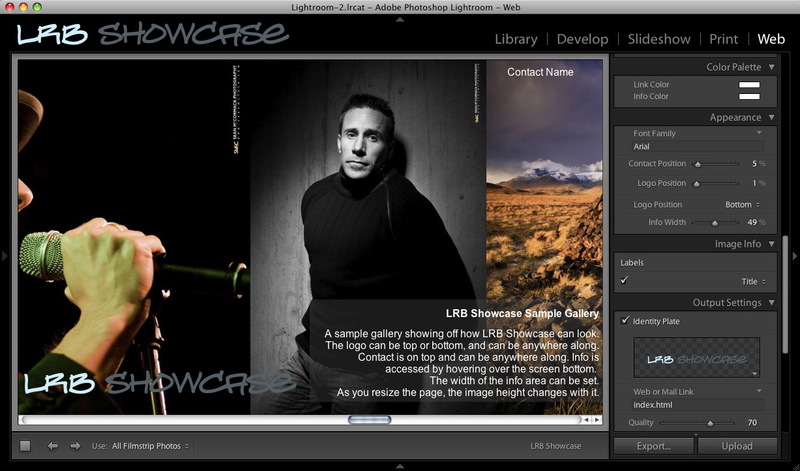 LRB Showcase is a Web Gallery Plugin for Lightroom 2, 3, 4 & 5, designed for showing a small number of images in a scrolling gallery. It displays large images which automatically resize to fit the screen size. Information about the gallery is visible by hovering over the bottom of the page. The gallery also features customisable logo via the Idenitiy Plate and logo positioning. The logo can link back to another page, acting as a handy back button. There is also a Contact Name option to trigger either another page or as an email contact. The gallery is also compatible with Matthew Campagna’s Auto Index galleries. This means it can be used as the gallery with one of Matthew’s site plugins. Download a quickstart guide here.